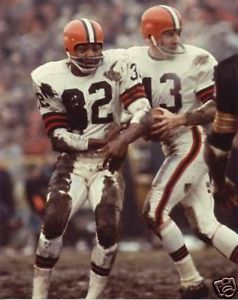 Browns Browns Archive Cleveland Sports Vault: Cleveland Browns Nickname Quiz – With Actual Fan Comments! 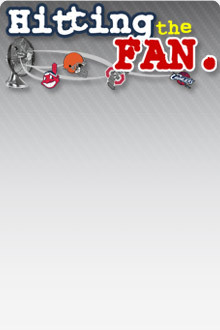 Cleveland Sports Vault: Cleveland Browns Nickname Quiz – With Actual Fan Comments! a) The holiday decorations at work currently feature an epic battle between black Halloween bats and smiling white snowmen. b) For the Popelka clan, it is the season of apple cider and powdered donuts. Mmmm. c) For Cleveland Browns followers (and to paraphrase Paul Brown), in the near term, their hopes for future are in their past. It’s time to focus on next year’s college draft. That question was a gimme. And now that you are warmed up, you are ready for today’s Browns nickname quiz! Many of these are well known, but some are fairly obscure. I took some liberties with a few of them, but I think most of these are fair to include. I avoided the most obvious re-worked names and initials, such as “MoMass”, “Diek”, “PB”, and “KJ”. By the way, I believe team titles and Hall of Fame players aren’t the only gauges in measuring the depth and breadth of a sports franchise. I would be surprised if many other NFL teams boast of as many nicknames as the Browns. 33. Bonus: Who said he didn’t want a nickname- that nicknames were for “sissies”? It’s interesting how many of the nicknames come from the rosters of playoff teams. Seems like a great way for a player to endear himself to fans. 1. 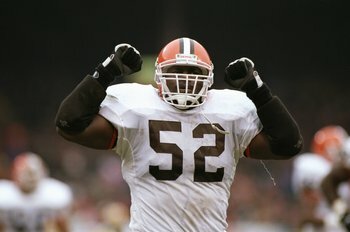 Turkey One fourth of what Doug Dieken has called “the best defensive line in Cleveland Browns history” (along with Jerry Sherk, Walter Johnson and Jack Gregory). Joe Jones famously ignited the home crowd by bear-hugging Steelers quarterback Terry Bradshaw and spiking him as the Browns eked out an 18-16 win. This was in 1976- Turkey Jones’ second stint in Cleveland after playing some in Philadelphia. In a small tradition that Art Modell stole from the Browns when he moved the team due to mismanagement and selfishness, vets sent rookies out to pick up “free turkeys” ahead of Thanksgiving every year. It was a trick, as the rookies spent a portion of their off-day searching for a mythical rural location. Some would drive up and down the highway, perhaps stopping at a farm to call and verify the address. Turkey Jones received his nickname for falling for the prank. 2. 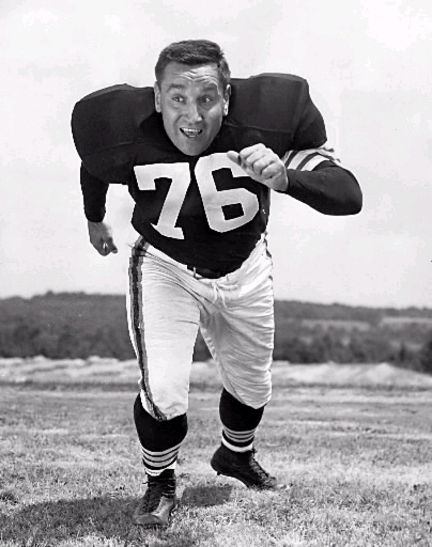 The Toe Local fans would agree: Lou Groza would be featured on a Cleveland Browns “Mount Rushmore.” He was the stalwart left tackle of coach Paul Brown’s heyday, and his ability in kicking field goals and extra points made him the standard-bearer in that realm as well. As with so many of the old Browns, though, the popular Groza was a Brown for life. 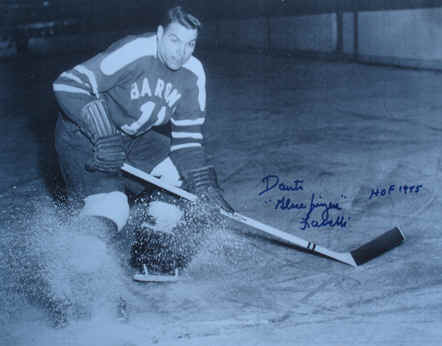 Lou “The Toe” remained a visible ambassador for the team and the city. He died in 2000, but not before helping to demand, and then observe, the return of the NFL to Cleveland after Art Modell moved the original Browns. 3. 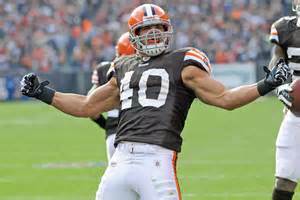 The Albino Rhino In 2010, Browns running back Peyton Hillis was a breakout star. Acquired after the 2009 season for quarterback Brady Quinn, he began receiving playing time when Jerome Harrison and James Davis suffered injuries. He ended up with 1,177 rushing yards and 11 touchdowns. The next spring, he was voted the winner of the 2011 Madden cover. - Flew to Arkansas to get married on a game-week Tuesday rather than have his injured hamstring receive treatment. - Was notably late for at least one team meeting, and missed a charity obligation. - Removed himself from the lineup after contract negotiations with president Mike Holmgren broke down- citing strep throat. - Practiced throwing long passes during pre-game warmups in front of teammates in San Francisco, while out with a sore hamstring. The Browns had had enough. By November, they made it clear they would not seek to re-sign Hillis for 2012. He backed up Jamaal Charles of the Kansas City Chiefs for a season, and has latched on with the Giants in 2013. 4. Ice Cube Drafted in 1984 out of Baylor University by the Houston Gamblers of the NFL-rival USFL, Gerald McNeil was taken by the Browns in the 1984 Supplemental Draft of CFL and USFL Players. He was an exciting punt and kickoff returner during the Kosar era, and played a little wide receiver too. 5. Man-Genius After the 2008 season, Phil Savage and head coach Romeo Crennel were finally fired by owner Randy Lerner. Lerner heard of Eric Mangini’s availability (he had just been let go by the New York Jets), and almost before his next breath, he made the Bill Belichick protege the new Browns coach (the actual time lapse was nine days- including the New Year’s holiday). 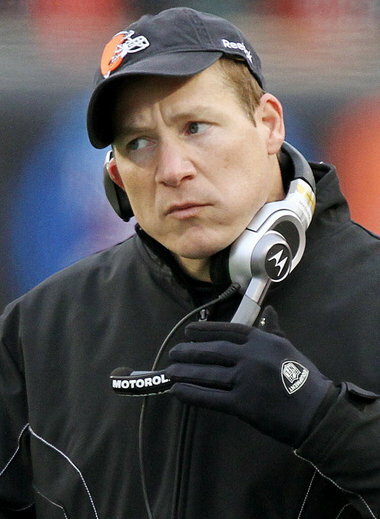 The word on the Browns locker room under Mangini was that he beat them down with micro-management. He clearly was not the answer. When Holmgren was brought in by Lerner (in a rush that was reminiscent of his Mangini hire), he delayed the inevitable by retaining the coach for his first year as team president. 6. Gluefingers Dante Lavelli was one of Paul Brown’s original core guys. QB Otto Graham, FB Marion Motley, WR Mac Speedie, and Gluefingers. 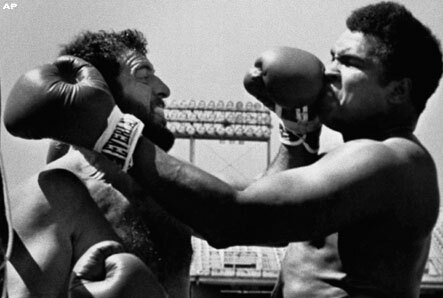 Throughout his life, Brown raved at the strength of Lavelli’s hands. He seldom lost in a battle with the defense over a Graham pass. 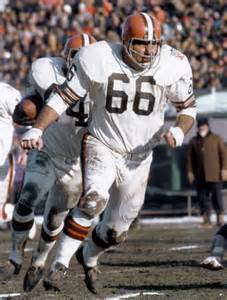 Like Groza and several other Browns players, he was an Ohio boy who’d been a Buckeye, then a Cleveland Brown for life. 7. Automatic Automatic Otto was the man to lead Paul Brown’s vertical offense in that first, great, championship Cleveland Browns era. PB’s Ohio State Buckeyes had encountered Graham when the latter quarterbacked Northwestern in the early 1940s. After a short stint in WWII, Graham played for a professional basketball team for one season before Paul Brown signed him in 1946. 8. 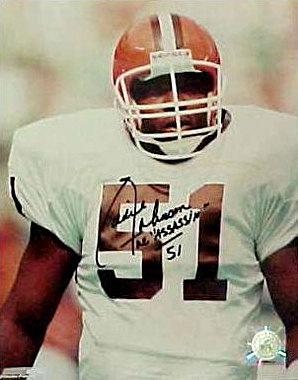 Bubba Al “Bubba” Baker joined the Browns later in his career (in what was then an unofficial stat, he recorded 23 sacks as a rookie for the Detroit Lions- and no, that is not a typo). He only played in Cleveland for a few seasons, but makes his home there, and is regarded fondly by fans. His barbecue joint (Bubba’s-Q) will soon be featured on TV. 9. Thriller A target of Brett Favre’s back at Southern Miss, Michael Jackson was a nice find in the sixth round of the draft for the Browns. He was a weapon on the early 1990s Bill Belichick teams. He played with Baltimore after the move, for a short time. 10. 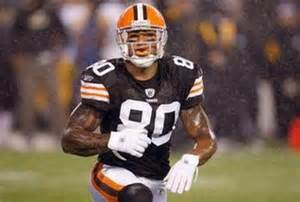 KII Butch Davis, the Browns head coach in 2004, had recruited Kellen Winslow II to the University of Miami. Butch looooved Big East players, especially the ones he recruited. So of course, that meant he absolutely needed to trade a second round pick to the Detroit Lions in order to move up one spot in the first round, from the seventh pick to the sixth (this was the draft in which Miami University quarterback Ben Roethlisberger fell all the way down to the Pittsburgh Steelers at number 11). Winslow’s career with the Browns was marked by immaturity and injury. A stunt motorcycle accident in a parking lot virtually defined his time in Cleveland. He was a fierce competitor, however, and when on the field, his pass-catching ability made him a solid NFL weapon. 11. 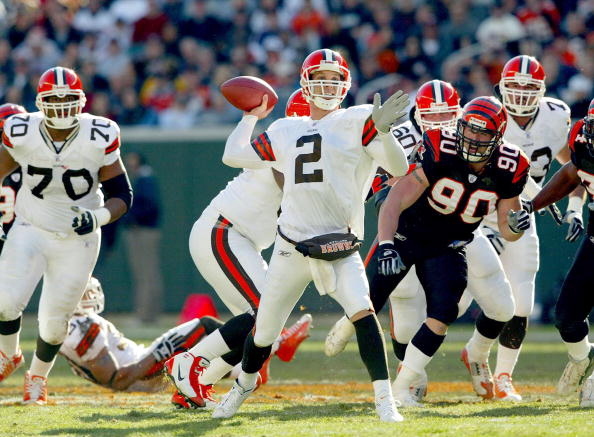 The Deuce The quarterback, Number 2, of the 1999 expansion Cleveland Browns. Tim Couch played in Cleveland through 2003, becoming battered and bruised leading and offense that had no real weapons and a subpar offensive line. 12. Bad Moon Andre Rison was emblematic of the bad vibes surrounding the Browns in 1995. Art Modell, whom as we learned could not afford such luxuries, had signed the receiver to a large contract. That season, Rison had one of the worst years of his career. He and booing Browns fans clashed, and then the team was gone. 13. 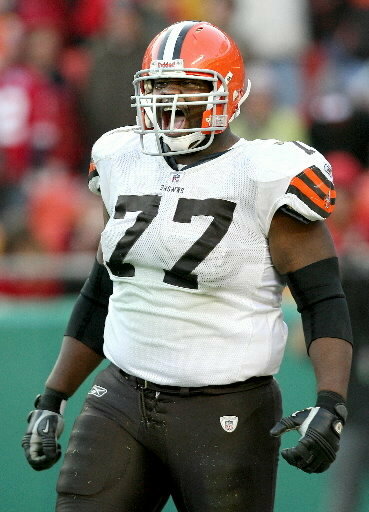 Pork Chop The Browns signed free agent guard Floyd Womack in 2009, after he’d helped anchor the right side of the Seattle Seahawks’ offensive line going back to 2001. He played in Cleveland for two seasons. 14. T-Bone The Browns hit the jackpot in 1988, with Tony Jones. The left tackle had gone undrafted out of Western Carolina, and became a fixture in the latter years of the original Browns. He was on the team when they moved, playing one season in Baltimore. He was a Pro Bowler in Denver in 1997. He earned his nickname in college: the team ate steak every Wednesday, and he stole from the younger players. 15. Foghorne Reggie Langhorne’s nickname came from the cartoon rooster, of course. The receiver out of Bethune-Cookman was the opposite bookend of Webster Slaughter. The Browns may not have protected Bernie Kosar from debilitating collisions, but they did arm him with a potent arsenal of weapons. Once Bill Belichick arrived on the scene, Langhorne was one of the veterans he ran off. 16. 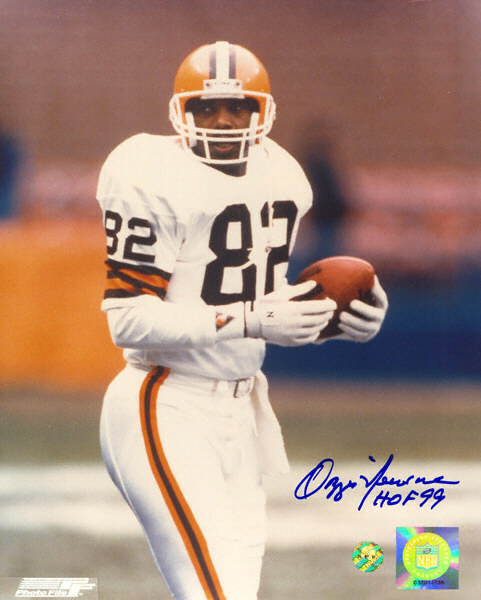 Wizard of Oz Ozzie Newsome’s rookie season with the Browns was in 1978. This was also the rookie season of another Hall of Famer- baseball’s Ozzie Smith. The St. Louis shortstop always seemed to get more attention as “The Wizard of Oz” than our guy, but hey- the Cardinals won it all. Ozzie Newsome was a favorite target of Brian Sipe’s, and later, of Bernie Kosar’s. He set receiving records as he helped revolutionize the tight end position along with Kellen Winslow Sr. of the San Diego Chargers. 17. Wizard of Boz This one might be my favorite nickname. Keith Bosley was a replacement player during the 1987 strike games. He was huuuge. He didn’t really look like an athlete. At that time, fans fashioned a lot of signs out of bed sheets, and displayed them at the stadium. One paid homage to the Wizard of Boz. 18. Big Daddy Former Eagles defensive lineman Carl “Big Daddy” Hairston was part of the veteran core of head coach Marty Schottenheimer’s late 1980s contenders. I just learned his 20+-year coaching career currently has him with Canada’s BC Lions. 19. Mad Dog Not a nickname, per se. In 1987, Browns head coach Marty Schottenheimer publicized scout Dom Anile’s description of Duke linebacker Mike Junkin: a ‘mad dog in a meat market.’ Anile later lamented that he did utter that phrase- but never touted Junkin as a first round pick. The top player on the board was another linebacker, Shane Conlan out of Penn State (“Linebacker U”). Conlan had a fine career with the Buffalo Bills. Junkin made it obvious in training camp that he was not an NFL player. He intercepted a pass in an exhibition game, but Coach Marty admitted he was out of position. 20. The Assassin Eddie Johnson was a fan favorite. He was a ten-year player with the Browns of the 1980s. He started some, and settled into a role as a goal-line run stuffer. He died a young man, in 2003 from colon cancer. 21. Top Dawg One half of what NFL.com calls the “Number 2 cornerback tandem in NFL history.” He was the one to start the whole “Dawg Pound” thing. 22. 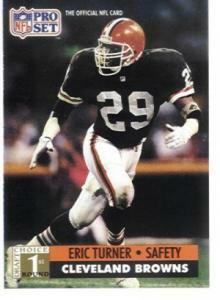 E-Rock Eric Turner was a star safety whom had been compared to fellow UCLA Bruin, and Cleveland Brown, safety Don Rogers. 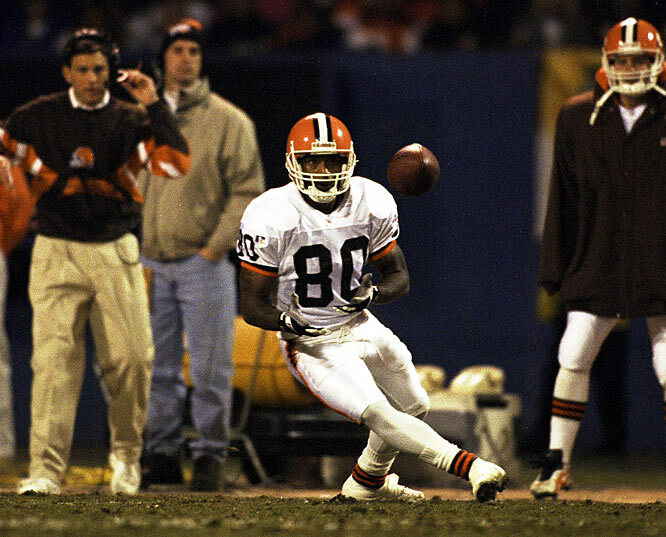 The Browns selected Turner with the second overall pick in 1991. He was a star on the team, pre-move. Turner died at age 31, in 2000, from intestinal cancer. Fan Comment: “I think his was the first of the “-Rock” nicknames. 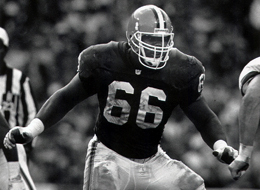 Others followed, such as the Bengals’ David Fulcher (“Ful-Rock”). 23. 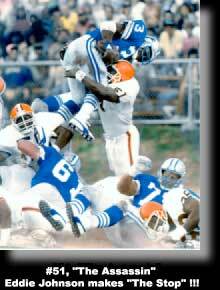 Flex Felix Wright was signed out of the Canadian Football League by the Browns in 1985. His best years were alongside cornerbacks Dixon and Minniefield. 24. Touchdown Stanford fullback Tommy Vardell was the top draft pick of Bill Belichick in 1992. Cardinal head coach Denny Green had given him his nickname. Unfortunately, Vardell did not score touchdowns in the NFL at the same pace he did in college. After a couple seasons, injuries took their toll and his career wound down in the late ‘90s. 25. Pepper Buckeye fans recalled Pepper Johnson from the linebacker’s days patrolling Ohio Stadium. He’d been a star on the Super Bowl-winning New York Giants teams of the ‘80s. Then-assistant Bill Belichick brought him to the lakefront when the former became coach of the Browns. He helped stabilize the Cleveland defense for three seasons, pre-move. 27. Route 66 Gene Hickerson paved the ‘road’ ahead of the likes of Hall of Fame running backs Jim Brown, Bobby Mitchell, and Leroy Kelly. He missed two games in 1962, and that was it, over a career that spanned from 1957 to 1973. 28. Curly Fred Morrison was a Buckeye running back in the late 1940s. The Bears drafted him with the Number 10 pick in 1950. 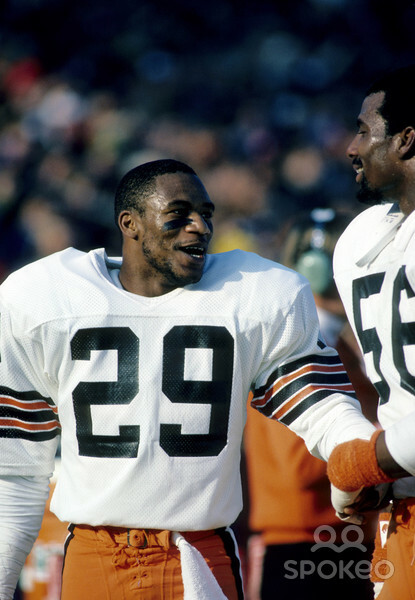 After four seasons, Paul Brown traded for him. He basically helped bridge the gap between the eras of Marion Motley (which ended after 1953) and Jim Brown (which began in 1957). Fan Comment: “Fred freakin’ ‘Curly’ Morrison. 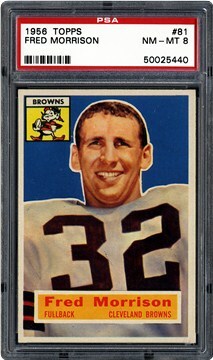 The man who caught wind that the Cleveland Browns were for sale in 1961. Morrison was working for CBS as an ad salesman, calling on the Akron rubber companies. As Dan Coughlin relates in his book, Pass the Nuts: When in the area, Morrison always stopped by The Theatrical restaurant and bar in downtown Cleveland. Morrison was told that while the current Browns ownership group was happy with their investment, they were now looking to free up cash. They had an offer on the table: $2million. Morrison knew a secret that even NFL owners did not know. He knew that CBS and the NFL were about to sign a new deal. It would net each team about $1million. He told the Browns’ owners that he could get them a buyer who would pay $3million. They agreed to let him broker a deal. He was given thirty days. His finder’s fee would be 10%. 29. The Professor Frank Ryan was a math professor at Case Institute of Technology, while he was playing for the Browns. He led the team to the 1964 NFL Championship. 30. Big Money Gerard Warren was selected third overall in the 2001 NFL draft by the Cleveland Browns. He was selected ahead of LaDainian Tomlinson, Richard Seymour, Santana Moss, Steve Hutchinson, Casey Hampton, Reggie Wayne, and other Pro – Bowlers. 31. 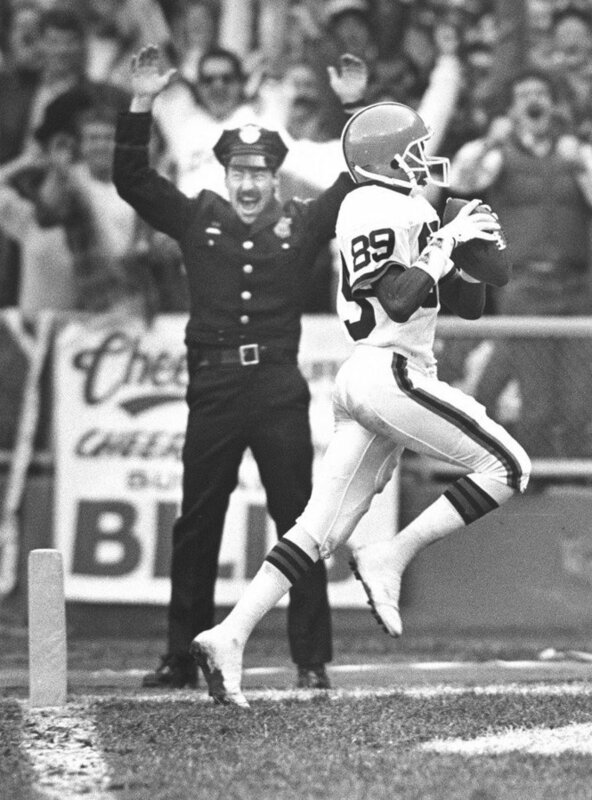 Webstar Bernie Kosar’s best receiver, and one of the best receivers in Cleveland Browns history. Selected in the second round out of San Diego State University in 1986, on the recommendation of all-time great Paul Warfield. Sent away as a veteran by Bill Belichick in 1992. Fan Comment: “This is very close to our rule of avoiding re-working last names. My wife and I had a brush with Webster Slaughter once. It was in 1989. Coach Marty was gone, but the team was still competitive. Bernie Kosar had just led the Browns to a thrilling Monday Night win over the contending Bears, highlighted by a 98-yard touchdown pass up the left sideline into the Dawg Pound. 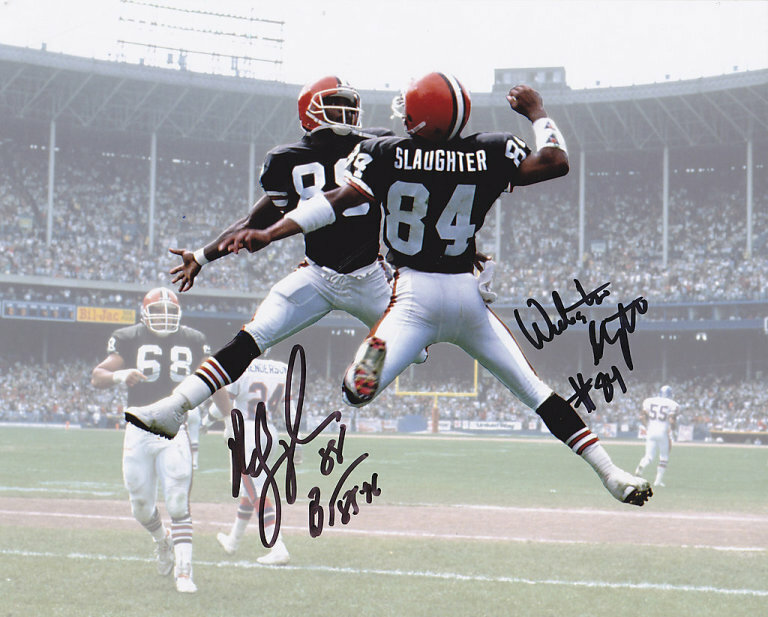 Kosar and Slaughter were usually on the same page, and they each knew what was coming as they lined up for the play. Once Webstar grabbed the bomb, it appeared the safety would knock him out of bounds. After a pirouette and some tight-rope stepping, he coasted to the end zone. The old stadium’s electricity gauge was pegged. After the game, we milled about outside of the player exit. Small groups began popping out, and fans cheered. Head Coach Bud Carson appeared, and his broad smile was startling- previously, I’d only seen his serious stare. All of a sudden, we found ourselves standing in a small circle with Webster Slaughter. Like many others, he was in no hurry. So what did I say? “Hi, Mr. Slaughter.” He greeted me back. 32. The Baabarian A late round pick by the Browns at the end of the Brian Sipe era in 1982, Mike Baab was a fixture in Bernie Kosar’s offense. In 1988, Marty Schottenheimer tried to replace him with 1987 second-rounder Gregg Rakoczy; he traded Baab to New England during camp in 1988. The timing was troubling, and the shock to the offense seemed unnecessary. 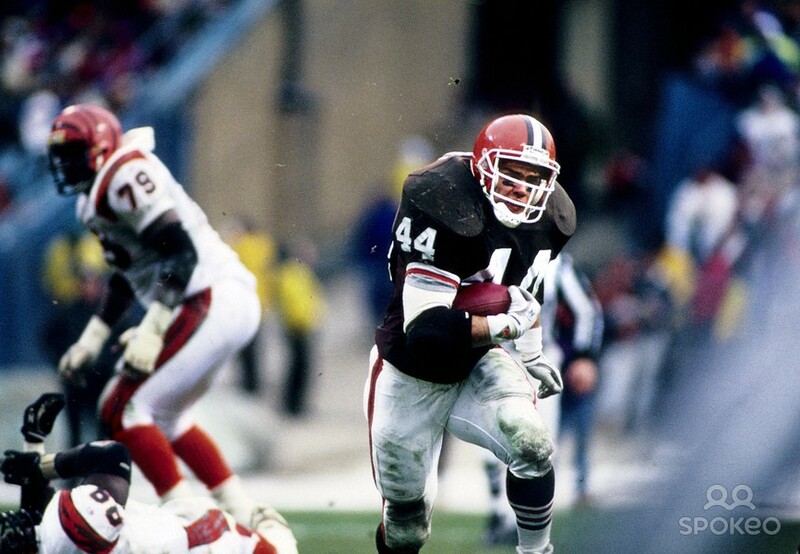 Baab was brought back to the Browns in 1990, and he gave that team a shot in the arm. 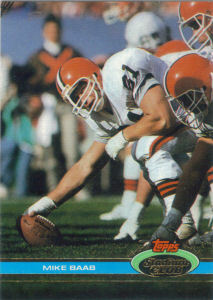 Rakoczy left the Browns in 1990- landing with New England, as well. 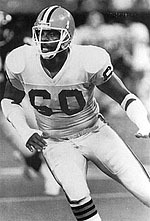 Mike Baab’s second stint with the Browns ended after 1991. He played one more year, in Kansas City- under Coach Marty. I read where Jim Brown (below, with Browns fan Elvis) was known as “First Down Jim Brown.” I never heard that before. I seem to recollect that he rejected nicknames. That fits with his personality, although I could not actually corroborate the statement.